VeloPress will host six author events during Interbike featuring top cycling and triathlon coaches and experts. All events will take place at the VeloNews booth #3359 and all books except Cycling's Golden Age will be available for sale at a discount price. Wednesday, September 27, 2:00-3:00 p.m.: Meet Hunter Allen, one of the world's top power meter coaches and co-author of Training and Racing with a Power Meter. This is the first and only book that fully explores the benefits and methodology of training with power. Answer your customer questions with authority. The book is complete with a guide to purchasing a power meter. Wednesday, September 27, 4:00-5:00 p.m.: Cycling legend Eddy Merckx will autograph copies of Cycling's Golden Age: Heroes of the Postwar Era, 1946-1967. This beautifully illustrated coffee table book features never-before-seen items from The Horton Collection, the world's most astonishing trove of cycling memorabilia. 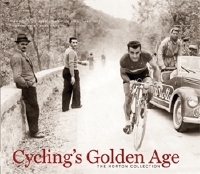 Painstakingly researched by cycling historian Owen Mulholland, with a foreword by Eddy Merckx, Cycling's Golden Age tells the personal stories of cycling legends like Coppi, Bartali, Hinault, Simpson, and Anquetil through newly restored photographs, jerseys, trophies, and other cycling artifacts. The book will be available for sale at the booth for the full retail price of $49.95. Merckx will only sign copies of Cycling's Golden Age, other items for autograph will not be allowed. Thursday, September 28, 12:00-1:00 p.m.: Meet Andy Pruitt, the internationally recognized leader in bike fit and injury treatment and prevention. Pruitt will answer questions and autograph copies of his book, Andy Pruitt's Complete Medical Guide for Cyclists. The book features a complete bike fit session and easy-to-follow directions on diagnosing and treating common cycling injuries. Andy Pruitt's Complete Medical Guide for Cyclists is mandatory reading for bike fitters and anyone who rides often. Thursday, September 28, 1:00-2:00 p.m.: Meet top cycling and triathlon coach Joe Friel and Cycling Peaks coach Dirk Friel. Joe and Dirk will answer questions and autograph copies of shop-friendly bestsellers like The Cyclist's Training Bible, The Mountain Biker's Training Bible, The Triathlete's Training Bible, and Workouts in a Binder® for Indoor Cycling. Thursday, September 28, 2:00-3:00 p.m.: Meet VeloNews magazine illustrator and Pearl Izumi Art Director Dave Brinton. Brinton will autograph copies of Les Héros du Vélo, a 2007 calendar featuring Brinton's unique illustrations of cycling legends. Friday, September 29, 11:00 a.m.-12:00 p.m.: Meet VeloNews magazine illustrator and Pearl Izumi Art Director Dave Brinton. If you miss Dave Brinton's cycling illustrations on Thursday, you have a second chance. Brinton will autograph copies of Les Héros du Vélo, a 2007 calendar featuring Brinton's unique illustrations of cycling legends. VeloPress is an endurance sports publisher focusing on the sports of cycling and triathlon, with training books that help both serious athletes and beginners build skills and fitness. VeloPress also publishes historical and biographical books that take a closer look at the celebrated athletes and personalities in our sports. VeloPress is the book publishing division of Inside Communications, Inc., publisher of VeloNews and Inside Triathlon magazines.